Along with Harriet Lane’s Her which I’ll be reviewing in a few weeks, this is the book I had been most looking forward to in the June publishing schedules. It’s not entirely true, although that wouldn’t trip of the tongue as a title, but it is splendid. Michelle Lovric has transplanted the story of the Seven Sutherland Sisters from America, where they joined Barnum and Bailey’s Greatest Show on Earth in 1882, to Ireland then Venice spinning a rattling good rags-to-riches then back again yarn out of it. The Swiney sisters are dirt poor. Their mother keeps geese and takes in laundry while Phelan Swiney, Mariner, returns once a year to father another daughter before disappearing. All seven sisters are blessed with an abundance of hair, gloriously thick and falling well below their knees. When our narrator Manticory is lured under a bridge by a man besotted by the sight of her hair and determined to have his way with her, Darcy, the eldest, sharp as a tack both in brain and tongue, spots a business opportunity. She sets up a show which is ostensibly musical but its finale is really what the spectacle is all about: each of the sisters lets down her luxuriant hair which coils and gently unfurls until, quietly tipping back their heads, it touches the floor. Cue gasps of appreciation. Soon, the sisters are besieged with attention from which emerges a business proposition: Mr Rainfleury wishes to manufacture dolls in their image and market them through the sisters’ performances. He’s joined by Tristan Stoker with his plans for miraculous hair preparations and the Swiney Godiva Corporation is born. The sisters move to Dublin leaving Harristown and Eileen O’Reilly – ‘the butcher’s runt’ and Darcy’s bête noire – far behind. From the very beginning Lovric’s use of language is as colourful as her story; her descriptions of Venice and its palazzos are particularly lovely. Manticory’s voice is vibrant, intelligent, endearing and, at times, very funny. The ‘Brotherhood of Hair’ and their unhealthy obsession fills her with contempt for them and distaste for what she and her sisters do on stage – this is the era in which the Pre-Raphaelites are busy painting models with enticingly arranged hair and poets rhapsodise about their mistresses’ flowing locks. The luxurious grandeur of the sisters’ Dublin house unsettles Manticory who becomes increasingly suspicious of Darcy’s tight hold on their purse strings. Arguments and alliances come and go amongst the sisters but Darcy’s cruelty – both verbal and physical – remain constant. When the press starts sniffing around, events take a calamitous turn in what is a very modern take on celebrity and the media. It’s a thoroughly entertaining tale in which love, lust, tragedy, comedy and revenge all play their part, and it ends very satisfyingly. Lovric has included a short essay on the historical context for the novel which is almost as colourful as the book itself. This will be my last post for a couple of weeks. We’re off on our hols tomorrow, walking in the Dolomites and squeezing a few books in as well I should think. Happy reading! 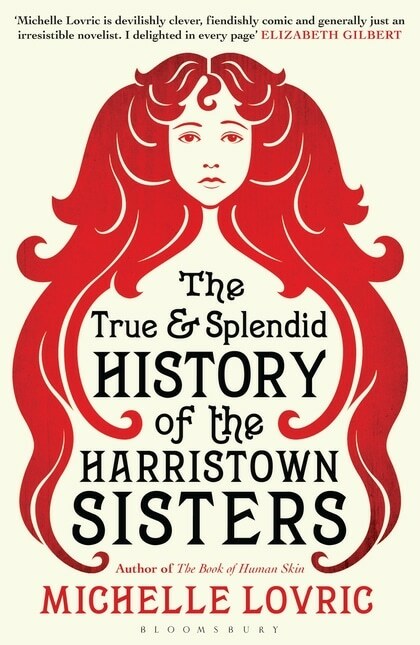 This entry was posted in Reviews and tagged Bloomsbury Books, Fiction, Michelle Lovric, Seven Sutherland Sisters, The True and Splendid History of the Harristown Sisters on 22 June 2014 by Susan Osborne. Enjoy your holiday – and see you in July! Finally. Just finished The Goldfinch and slightly disappointed with it somehow – couldn’t believe the plot by the end. Thanks, Rachel. Looking forward to seeing you soon. I think you’re in good company re The Goldfinch – lots of people seem to feel that it all got a little out of hand. Thanks so much, Claire. What a lovely compliment to come home to!